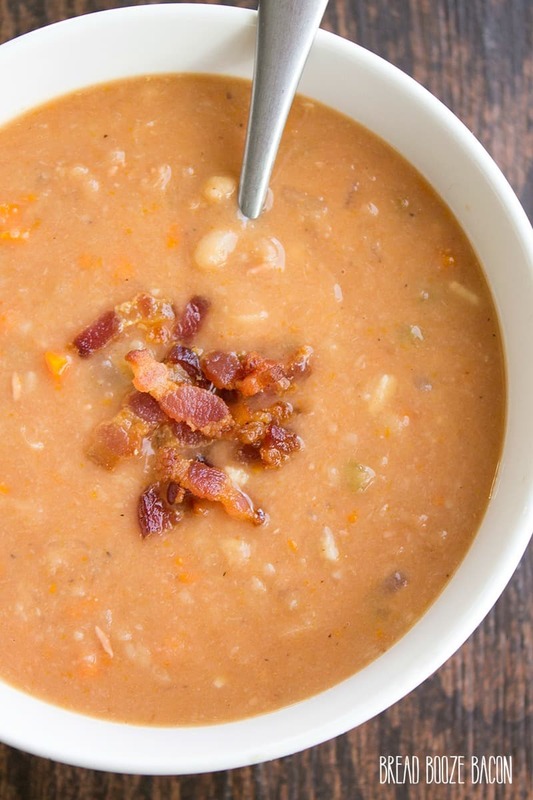 Bacon Bean Soup is what comfort food is all about! Easy to make and full of flavor for a meal you’ll love! It will keep you warm during the chilly months! Soup is one of my go-to meals in the fall. They’re so easy to make! While most recipes do require a little time (AKA love) the flavors are worth every minute! This soup is no exception. I couldn’t stop eating it. I loved it so much I even made my friends try a spoonful of the leftovers (and my Bacon Jam) when they stopped by…I’m a little crazy like that. They thought is was great! I love the validation. I made this recipe using canned beans. If that’s not your thing, grab some dried great Nothern beans and soak them in water overnight. Drain the beans and then add them to the soup per the recipe. I’m a convenience girl sometimes and the canned beans cut out some serious prep time. There’s also the matter of how much broth to use. I generally like my bean soups on the thick side, that being said I opted to use 3 cups of broth for this recipe. The soup came out runnier than I normally like, but everything was still delicious! If you like your soup thick too, add 2 cups of broth and proceed as directed. 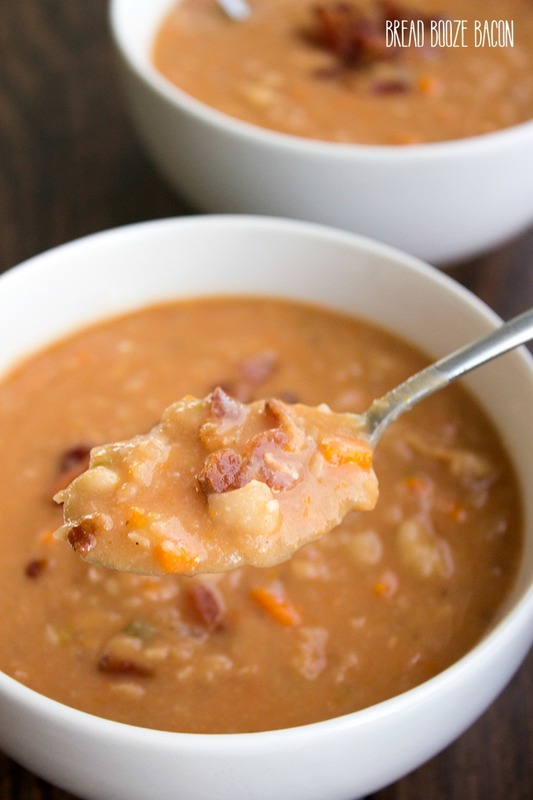 No matter how you like it, this Bacon Bean soup will satisfy even the biggest bacon freaks! 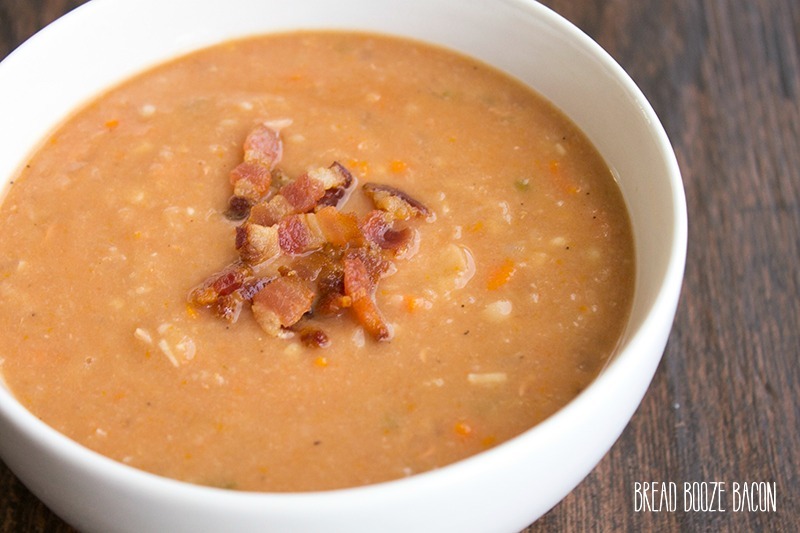 Bacon Bean Soup is what comfort food is all about! Easy to make and full of flavor for a meal you'll love! It will keep you warm during the chilly months! Heat a large pot over medium-high heat. Add bacon and cook until crispy, about 5 to 8 minutes. Remove to a paper towel lined plate. Discard all but 2 tablespoons of the bacon fat. Add the onion, celery, carrots, and garlic to the bacon grease. Cook for 5 minutes until soft. Add the beans and chicken broth. Stir to combine. Add the bay leaf. Increase heat to high and bring the soup to a boil. Reduce heat to medium and simmer for 1 hour, stirring occasionally. Return the soup to the pot (unless you used your immersion blender) and add the tomato sauce. Stir to combine. Add 1/2 of the bacon back into the soup, and season with salt and pepper to taste. Portion soup into serving bowls and garnish with remaining bacon. Serve immediately. If you like your soups thicker, use 2 cups chicken broth. If you don't mind your soup on the runny side, use 3 cups broth. This post first appeared on Yellow Bliss Road where I am a contributor. No idea. 🙂 I usually make enough for us to have at dinner and maybe one serving leftover. If you try freezing, I’d love to know how it comes out! You’re totally speakin’ my language with this soup! 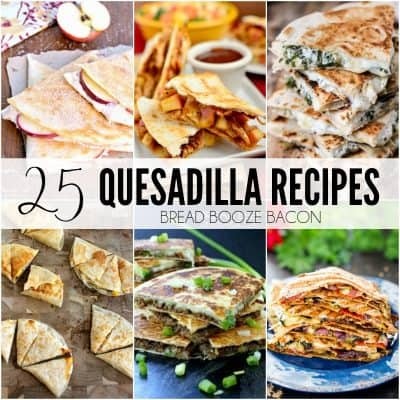 I have a feeling we’ll be making this sometime soon because it sounds so comforting for this chilly weather we’ve been experiencing. 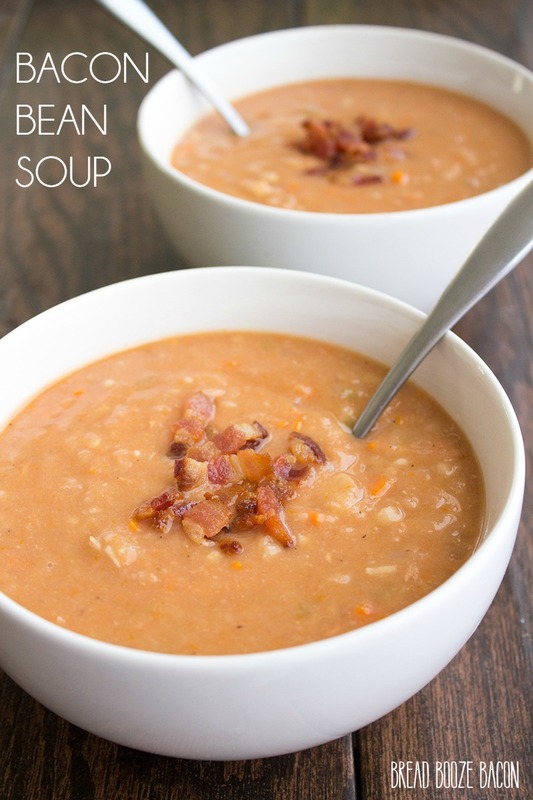 Love the sound of this – soups are so often watery and bland, but this looks to be neither! Perfect for all this cold winter weather.